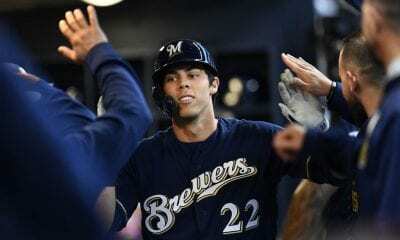 On the day Oakland’s Khris Davis posted his second consecutive multiple home run game and New York Mets rookie Pete Alonso clubbed one with an exit velocity over 118 mph in Atlanta, the Seattle Mariners became Major League Baseball’s king of the long ball. When second baseman Dee Gordon homered in the sixth inning of Thursday’s win in Kansas City, the Mariners broke MLB’s all-time record by having at least one homer in each of the first 15 games of the season. So it shouldn’t be a surprise to know their 13-2 record, compiled on two continents, is currently the best in the game. You’ll recall Seattle opened the season with a pair of wins over Oakland in Toyko. So power baseball obviously does not get lost in translation. The previous mark was 14 games, set by the 2002 Cleveland Indians. 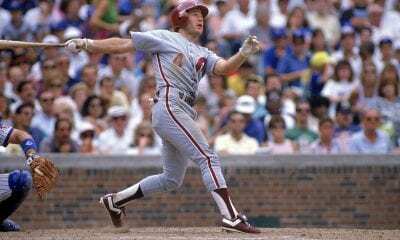 That team was led by Hall of Famer Jim Thome, who clubbed 52. And Ellis Burks added 32. But it also ended the season 74-68, which tells you there’s more to baseball than hitting more home runs than everybody else. Hey, the Yankees set the MLB record with 267 and still finished second to the Boston Red Sox in the AL East last season. Whose record did they break? The 1997 Mariners hit 264 with Ken Griffey, Jr., (56), Jay Buhner (40), Edgar Martinez (28), and Paul Sorrento (31) leading the way. And by the way, the 2018 Yankees had only 21 homers in their first 15 games last season. Still, if you are interested in the math, the Mariners are on pace to hit 388 homers this season. And that would be pretty damn awesome, wouldn’t it? To their credit, the home runs have been flying off a number of bats. 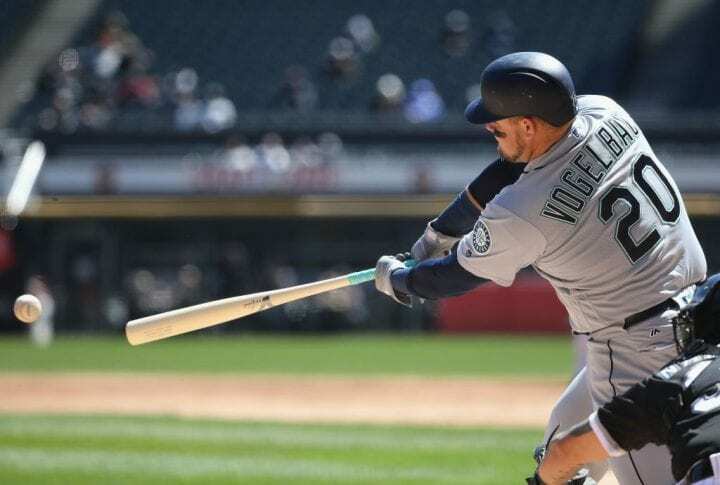 Daniel Vogelbach’s homer late in Thursday’s game was instrumental in Seattle’s 10-inning, 7-6 win over the dreadful Royals, who have lost 10 straight. Here’s is what the Mariners mojo has looked like this season. Each of their position players has at least one homer. Vogelbach’s 427-footer, with an exit velocity of 112.7 mph, gives him six, one short of Jay Bruce’s club lead. As for the veteran Bruce, he was considered a throw-in, a guy’s whose salary the Mariners were asked to eat, in the big Robinson Cano-Edwin Diaz deal with the Mets in the offseason after hitting just .223 with nine homers and 75 strikeouts in 94 games. The Mariners lead the American League with 36 home runs and a .295 average and are off to their best start since 2001 when the franchise tied the major-league record with 116 wins. This is big news when you remember the Mariners have not made the playoffs since that season, the longest such drought in pro sports in North America. Along with Bruce and Vogelbach, Tim Beckham, Edwin Encarnacion and Domingo Santana each have hit four homers thus far. The Mariners are just rolling. 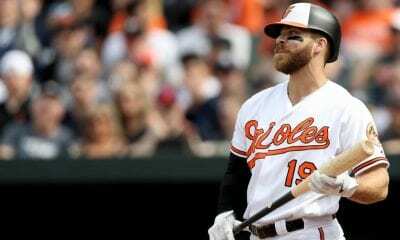 They have a plus-42 run differential this season and are leading the Majors by averaging 7.8 runs a game. Gordon leads the team with a .365 batting average. Vogelbach is hitting .400, Santana .349 and Encarnacion is at .326. But there’s more: The Mariners are the third team since 1987 to open with at least 13 wins in the first 15 games after Milwaukee (14-1 in 1987) and Boston (13-2 last year). 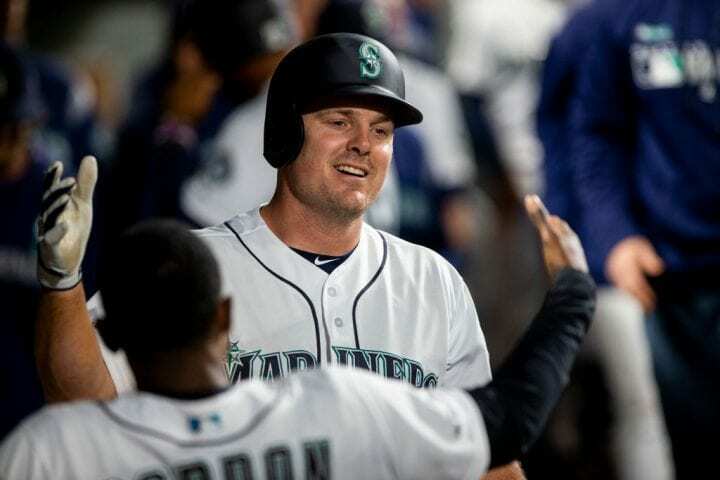 Seattle’s 36 homers tie with the 2000 St. Louis Cardinals for the most in the first 15 games and the Mariners have scored five or more runs all but one once.